Home > News > Korea > Is it harder for internationals to find a Seoulmate? Is it harder for internationals to find a Seoulmate? 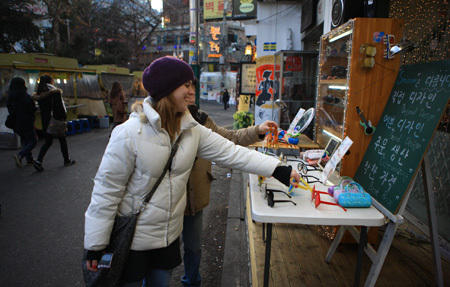 After Jenny, an American, decided to move to Busan to teach English, she researched the expat dating scene in Korea. And then she resigned herself to being single. “A lot of people say that Western guys in Korea only want to date Korean girls and Korean guys only want to date Korean girls,” she said. She eventually began going out with a Korean, a “rebellious and unique” man who “liked being different.” But her initial expectations reflected common perceptions about dating here, where it’s more common to see heterosexual couples of expatriate men and Korean women, than vice-versa. The number of Korean man-expat woman couples appears to be on the rise, however. While data on expat dating patterns are difficult to come by, longtime observers say the increase is visible in hip areas such as Seoul’s Itaewon and Hongdae districts. This may seem a matter of course, given the rapid growth of the foreign population, whose number recently surpassed 1.5 million. Still, it raises intriguing questions in a country where locals often joke about how Korean women are coveted for their beauty while the men are not as physically attractive. Such a shift would come as society grapples with newfound diversity. The number of foreign spouses living here has risen rapidly in recent years, a development linked to economic development. However, international couples and families face stigmatization, and in the dating scene, conditions vary by race and economic background. Early marriages between Westerners and Koreans occurred in the Joseon Kingdom (1392-1910), when foreign seamen found themselves shipwrecked on the coast. Law required that they stay in Korea, and some married Koreans. Agnes Davis Kim, an American woman who moved to Korea in 1934 to marry her Korean husband, described hardships faced by the few expat spouses of the era in her memoir “I Married a Korean.” Other expats pressured her not to go through with the marriage. “If you marry this man, your life will, without a question of a doubt, end in tragedy, for interracial marriages just will not work in Korea,” she was told. A major shift in the makeup of expat-Korean couples occurred in the late 1940s. “The reasons were manifold, but economy played a major role,” Lankov says. “Women from poor countries often tend to marry men from more affluent places…from that point on Korea had a number of Western men who were seen as affluent and hence attracted much attention. “Of course, the large U.S. military presence contributed, since the US Army brought to Korea a large number of young, unmarried, fit men from the U.S.,” he said. Many soldiers returned home with Korean wives. In recent years, various Internet blogs have popped up, focused on the expat dating scene. These reveal a list of common perceptions about Korean men — though these often come with caveats about over-generalization. Near the top is the observation that Korean men are “shy” and unwilling to try to strike up a conversation in a bar, for instance, a common way to meet dating partners in the West. Until recently, marriages were commonly arranged by family, friends or professionals, a result of Confucian mores that emphasized the separation of the sexes. Today, meeting new partners often involves being set up by friends, but increased travel abroad is beginning to diversify the scene, according to some. One Korean-American, who asked not to be named, said interacting with men here sometimes thrust her in between two cultures. “There can be a sense of feeling overlooked when I’m next to my Caucasian female friends. People just think, ‘She’s just Korean, but this girl next to her is so exotic,’” she said. Last month, Twitter exploded with racially-tinged insults when photographs of Kiwi singer-songwriter Lorde and her rumored boyfriend, who is of Asian descent, were posted online. The tweets touched a nerve because they hit on long-held stereotypes of Asian men as nerdy and un-dateable. 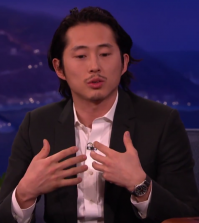 Sharon Heijin Lee, an assistant professor of social and cultural analysis at New York University, said new representations of Asian men are beginning to challenge these stereotypes, citing popular Korean-American actors Daniel Dae Kim (“Hawaii Five-O”) and Steven Yeun (“Walking Dead”) as well as Korean pop stars. The new images, she said, could affect international dating patterns. Racial stereotypes can be a hurdle to dating in Korea as well. Kychele Boone, an English teacher here, said “exoticization” of foreign women often extends to black women in ugly ways. Men “will come up to me or one of my friends, and try to speak urban slang, or say, ‘You’re black and wild in bed,’” she said, adding that in some cases, men have attempted to touch her or her friends inappropriately in public. Some link such attitudes to the Korean entertainment industry’s notorious misrepresentation of black people. Entertainers here have drawn criticism for racist caricatures, including comedians who present themselves in blackface. In the latest example, pop star Rain’s video for “L.A. Song” features an egregious caricature of a black woman’s body. After two years of marriage in Korea, Bradley has learned a few survival techniques for maintaining a relationship here — including one to deflect the occasional stares in the street. In long-term relationships, the American stressed the importance of being prepared for the cultural differences — including those with gender roles — that will inevitably arise. She and her husband, Jung Jae-oo, for example, have created “fighting rules” to avoid cultural misunderstandings. Kaye, the blogger, added that humor was essential for a healthy dating life.